The attorney for the family of Ronald Johnson, a 25-year-old man who was fatally shot by a Chicago police officer last year, said dashcam video released Monday does not show Johnson had a gun when he was shot and a witness cited in the case has testified he lied in his statement to detectives. 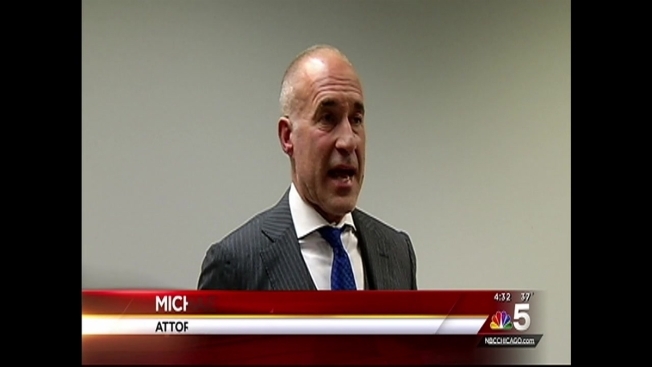 "This is a joke," Attorney Michael Oppenheimer said during a press conference Monday. Oppenheimer said that, despite claims from Cook County State's Attorney Anita Alvarez that "all evidence points to the fact that Johnson had a gun that evening," video released Monday does not show Johnson had any object in his hand. "It's a shadow," he said. "You can see no gun. There is no gun visible in Ronald Johnson's hand because there was no gun." Alvarez on Monday said the officer involved in Johnson's fatal shooting would not be charged in the case. “It is our determination that no criminal charges should be brought against Officer Hernandez because the crime cannot be proven beyond a reasonable doubt," she said. Oppenheimer called Alvarez's statements a "27-minute informercial" and argued that she never contacted George Hernandez, the officer who fatally shot Johnson, during her investigation. He also said a man who was with Johnson the night of the shooting and told detectives he thought Johnson had a gun in the car said during a deposition that he lied in his statement to investigators. Oppenheimer claimed the man, who was identified only as "Witness A," said "the idea of a gun came from detectives." Johnson was shot by Hernandez in October 2014 during an incident on Chicago's South Side. Video footage showing the fatal shooting shows Johnson running away from police when he was shot five times. The video does not show Johnson being hit by the bullets, but does show him lying face down in the grass after the shooting. Police said in a statement after Johnson was killed that officers responded to a call of "shots fired" on the 5300 block of South King Dr. on Oct. 12, 2014. When police approached the vehicle, they saw Johnson armed with a gun and ordered him to drop the weapon. Alvarez said when officers approached Johnson, he fled the scene on foot. During the pursuit, authorities said Johnson "pointed his weapon in the direction of the pursuing officers." "As a result of this action, an officer discharged his weapon striking the offender," police said in a statement at the time. Johnson was taken to an area hospital where he was pronounced dead. Oppenheimer says Hernandez pulled up in an unmarked police vehicle with his gun drawn. He added that within two seconds, Hernandez shot Johnson as he was running away. Hernandez said at the time that he felt threatened, city records show. He was placed on desk duty following the shooting, according to Oppenheimer. A weapon was recovered from the scene, police said in the statement. Alvarez added the gun had Johnson's DNA on it, but Oppenheimer argued that DNA came from Johnson's blood, and not fingerprints. Oppenheimer claimed the dashcam video does not show Johnson turning and pointing a gun at officers when he was shot. "This is a cover-up from the beginning," Oppenheimer said. Johnson's mother, Dorothy Holmes, said she's "very upset" that the officer involved in the shooting won't be charged and called Alvarez a "bold-faced liar." "I'm not going to stop until I get what I want for him and that's justice," she said. "If that had been anybody in her family that got killed like that, that officer would have been charged with murder." She said she wants the case re-opened and the officer charged with murder. As for potential protests surrounding the dashcam video's release, she said she can't stop anything from happening. "I'm not responsible for nothing that happens in the city of Chicago," she said.